When you're studying Caesar's Gallic Wars, it's much easier to understand what is going on if you have access to a good map. So I have put these maps here so you can see the geography of Gaul and where the various tribes are located. For example, you can see on the maps below that if the Helvetii cross over to the southern side of the Rhone, they would technically be in Roman territory, and Caesar was not OK with that. This first one is public domain. It shows a broad overview of the locations of the Gallic tribes. Click on it to view it full size in a new window. This next map shows the various tribes of Gaul in more detail. Click on it to view it full size in a new window. This map, by Feitscherg, is licensed under the Creative Commons Attribution-Share Alike 3.0 Unported license. In book I, chapter 6 of Caesar's Gallic Wars, Caesar mentions that there are two routes by which the Helvetii might leave their homeland. The first route Caesar mentions is the one that is "narrow and difficult, between Mount Jura and the river Rhone (by which scarcely one wagon at a time could be led)." On the map, that route is illustrated by bright blue dots. The river Rhone is the river the flows in a generally southwesterly direction from the southern tip of Lake Geneva. If you look closely, you will be able to see that the blue dots follow along on the north side of the Rhone, between the river and the mountains. This does indeed look like a narrow, difficult way to travel! But the advantage here is that this route keeps them out of Roman territory. 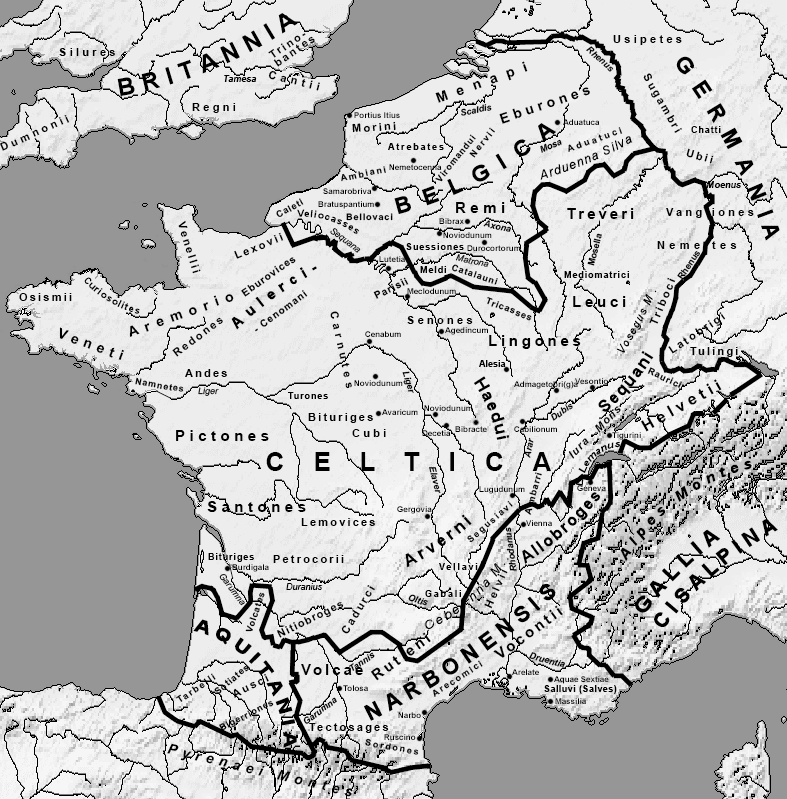 The river Rhone apparently is the border between the Sequani and the Roman territory known as Gallia Narbonensis. If the Helvetii were to cross over to the south side of the river, they would be on Roman soil (and that's a big no-no). 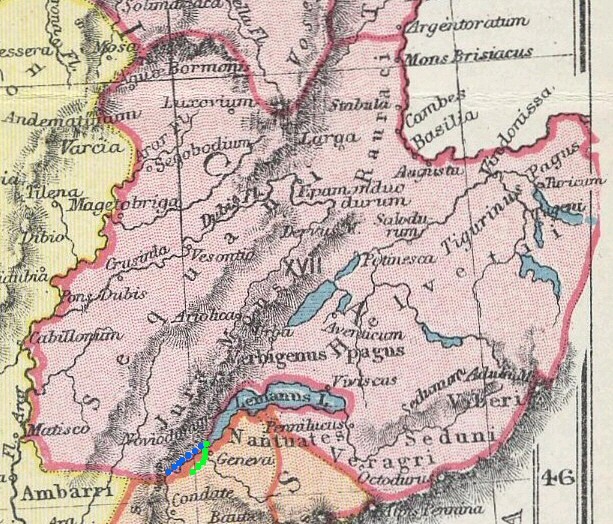 The second route that Caesar mentions in chapter 6 of book I is actually crossing over to the south side of the Rhone, into Gallia Narbonensis, in the territory of the Allobroges. 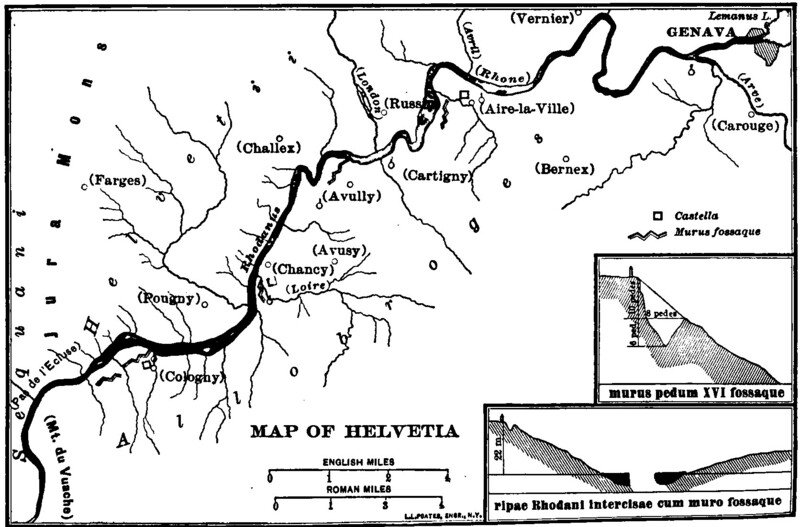 Caesar mentions that there is a bridge near Geneva, and also that in some places, the Rhone is shallow enough to wade across. This second route is indicated on the map with bright green dots. This map is in the public domain. Click on it to view it full size in a new window. Here is yet another map to help you see the geography of the area. It's a close-up of Geneva and the area just to the west of it. Here, you can see that the Rhone river forms the border between the Roman province (Gallia Narbonensis) and the area of the Helvetii. If the Helvetii try to cross over to the southern side of the Rhone, into the part of Gallia Narbonensis occupied by the Allobroges, Caesar will take military action against them. Notice that Mt. Jura comes very close to the Rhone, making it difficult for the Helvetii to travel west while staying on the northern side of the Rhone. Sometimes it's nice to read literature in English so you can understand the overall plot, and see the big picture. Here are some links to English translations of Caesar's Gallic Wars. An old Loeb Classical Library edition at Google Books. Loeb Classical Library editions are very useful because they have the original Latin (or Greek) on one page, with the English translation on the facing page for easy comparison. An English translation at Google Books. Since this translation is literal, it might help you if you get stuck when you are translating, or if you continue on past the part of the book covered by Linney's Latin Class. An interlinear translation of Caesar's Gallic Wars This old book has the literal English translation right under each Latin word in the text. This is a good book to consult if you get stuck. Another interlinear translation of Caesar's Gallic Wars This book only contains book I of Commentaries on the Gallic Wars, but also has a lot of explanatory notes along with the interlinear text. Wikipedia's article on Julius Caesar's literary work entitled Commentaries on the Gallic Wars. Wikipedia's article on the history of the wars that Julius Caesar fought in Gaul. The Roman Army. This is a link to a book on Google Books. In the front of the book, pages xxiii through xlvi contain an excellent overview of the Roman army and how it worked. The Roman Army. This is another link to a book on Google Books. In the front of the book, pages xvii through lxii tell you all about the Roman army. The Bantam New College Latin & English Dictionary by John Traupman My all-time favorite Latin dictionary. Cassell's Latin Dictionary This is my second-favorite dictionary (after the Bantam dictionary by Traupman). I use it when I need a little more detail about a Latin word. It also has some examples of how the word is used by Roman authors. 501 Latin Verbs In this book, each page is a chart showing all the forms of a given verb. I use it almost daily for reference. To read and print this Adobe Reader (PDF) document, you will need Adobe Reader installed on your computer. Many computers already have this free program installed. However, if yours does not, you may download it for free by clicking here. It's easier to translate something if you know the story and the overall context of whatever you are translation. Therefore I have provided a summary of each book of Caesar's Gallic Wars so you can easily get an idea of what is happening in the plot. Caesar describes a conflict with the Gallic tribe known as the Helvetii. The wealthiest man of the Helvetii, Orgetorix, convinced his countrymen that they should leave their homeland (modern day Switzerland) because they are too constricted by the surrounding rivers and mountains. They concoct a plan to burn their homes and then make a mass exodus out of their homeland. When Caesar learns of their plan to cross over a Roman province, a great conflict arises pitting the Romans against the Helvetii. The Helvetii are defeated by the Romans, and end up back in Helvetia, their numbers greatly reduced. Later, more problems arise surrounding a tribal conflict in Gaul. The Aedui (allies of Rome) are engaged in a power struggle with two other tribes called the Arverni and the Sequani. The Arverni and Sequani decide to get help in their struggle from German mercenaries from across the Rhine, led by a king named Ariovistus. At first the plan works because the German mercenaries help the Arverni and Sequani to oppress their enemy, the Aedui. But later the plan backfires as Ariovistus begins a violent takeover of the territory of the Arverni and Sequani, exercising a cruel tyranny over them. Caesar takes military action against Ariovistus for two reasons: first, because the Aedui are allies of Rome, and second, because Caesar wanted to stop the flow of Germans from across the Rhine into Gaul. Caesar moves his troops to Vesontio (modern Besançon), the capital city of the Sequani. Ariovistus and Caesar conduct many negotiations, including an unusual face-to-face conference. Two days later, when Ariovistus requests to speak with Caesar again, Caesar instead sends C. Valerius Procillus who is taken captive by Ariovistus. When the battle between the Germans and the Romans finally commences, there is fierce hand-to-hand combat. The Romans defeat Ariovistus, and Caesar is overjoyed to find and rescue C. Valerius Procillus, the envoy who had been captured earlier by Ariovistus. The Belgae, fearing the expansion of Roman military power in Gaul, begin to form a huge army to fight the Romans. The Remi, one of the Belgic tribes, breaks away from the Belgic conspiracy and offers its help to the Romans. This help from the Remi proves useful, as well as help from the Aedui (allies of Rome) in the form of cavalrymen. The military conflict that follows culminates in a huge battle with the toughest of all the Belgae, the Nervii. After bloody fighting, the Romans are victorious. Some Roman troops under Servius Galba are wintering peacefully in the Alps between Italy and Gaul. Suddenly, the occupied tribes strike at the vulnerable Romans, posing a grave threat. But the Romans fight back, defeating the tribesmen. Later, the Veneti, a seafaring tribe on the western coast of Gaul, begin a rebellion against Rome. Breaking an important tradition, the Veneti capture and imprison the Roman envoys sent to them. This infuriates Caesar. The Veneti, because of their great experience as sailors, exercise great advantage over the Romans in naval battle. But the Romans eventually adapt and defeat the Veneti. Caesar, wishing to make an example of the Veneti for violating the customs of diplomacy by imprisoning the envoys, executes their chief nobles and sells the rest of them into slavery. The Suebi, an enormous German tribe, have a reputation for physical toughness and military prowess. Two other smaller German tribes, the Usipetes and Tencteri, are tired of being oppressed by the Suebi so they decide to go west, crossing the Rhine and moving into the territory of the Belgae (more specifically the Menapii). Caesar quickly arrives with Roman troops. The Germans try repeatedly to bargain with Caesar but to no avail. After settling on a temporary truce, the Germans unexpectedly attack the Romans, causing casualties. Caesar considers this to be an act of treachery, and decides to break off any further negotiations with the Germans. The next day, the Germans send a large number of their leaders and elders to negotiate with Caesar. Caesar, expecting further treachery, takes these Germans prisoner. He attacks and defeats the remaining Germans who are disadvantaged by the absence of their leadership. As a show of force, Caesar constructs a sturdy wooden bridge across the Rhine and crosses into German territory, alarming the Germans. Later, Caesar makes arrangements for an assault on Britain. Although the Roman infantry successfully cross the English channel, the cavalry fail to cross, putting the Romans at a disadvantage. After being routed by the Romans, the Britons agree to submit to Caesar and disperse back into the countryside. But after a storm damages the Romans' ships and leaves them stranded in Britain without adequate supplies, the Britons decide to attack the Romans in their vulnerable state. The Britons initially catch the Romans off guard, but the Romans regroup and rout the Britons. When the Roman troops begin to cross back over to the continent, they are attacked by the Morini, who are then defeated by the Romans. Caesar commands that as many boats as possible be prepared during the winter for a campaign against Britain in the Spring. He orders all boats to assemble at Portus Itius (near modern day Boulogne-sur-Mer). Caesar’s attention is momentarily diverted to Gallia Belgica as Indutiomarus and Cingetorix struggle for power over the Treveri. Back at Port Itius, Caesar prepares to take many Gallic hostages with him to his British campaign so as to prevent revolts while he is gone. Among them is Dumnorix, a rebellious noble of the Aedui. Dumnorix violently opposes being taken over to Britain, and flees back to his homeland. Caesar stops all preparations while Dumnorix is hunted down and slain. The Romans sail to Britain to begin their campaign. There are some skirmishes between the Romans and the Britons, and a storm destroys many of the Roman boats. The British tribes, although previously at war with one another, band together to face the Roman threat with Cassivellaunus as their commander in chief. Caesar discovers the stronghold of Cassivellaunus near the Thames river and routs the Britons there. The Trinovantes, a powerful tribe, offer to become Rome's allies, and several other British tribes follow suit. From these tribes Caesar learns the location of Cassivellaunus and successfully attacks him there. Cassivellaunus orders the tribes in Kent to attack the British ships, but they are defeated. Cassivellaunus surrenders to Caesar, enabling Caesar to quickly return to the continent before Winter arrives. Because a drought has affected the grain supply, Caesar's troops must winter among the rebellious Belgic tribes. Roman troops, led by Q. Titurius Sabinus and L. Aurunculeius Cotta are wintering among the Eburones when they are attacked by the Eburones, led by Ambiorix and Cativolcus. Ambiorix deceives the Romans by saying that the attack was made without his consent, and furthermore advises them to flee because a huge German army is coming from across the Rhine. After much discussion and disagreement, the Romans decide to trust Ambiorix and leave the next morning. As the Romans are marching away the next morning, the Eburones ambush them, killing most of the Romans. A few Roman survivors make it back to their winter quarters where they commit suicide that night. Other Roman troops are wintering among the Nervii under Quintus Tullius Cicero (brother of the famous orator). Ambiorix convinces the other Belgic tribes to immediately attack Cicero's camp. Cicero's troops are trapped, outnumbered, and blocked from help as their messengers are intercepted. The situation gets progressively more desperate for the Romans, but finally they are able to get a message to Caesar. Caesar summons the other Roman legions and rushes to Cicero's aid. When Caesar approaches Cicero’s camp, the Belgae abandon their siege of Cicero's camp and head toward Caesar’s troops. Caesar, vastly outnumbered, creates a ruse, ordering his troops to appear confused and frightened. The ruse works and entices the Belgae to attack on ground favorable to the Romans. Caesar's troops counterattack and put the Belgae to flight. That same day Caesar’s troops reach Cicero's camp finding most of the men wounded. Meanwhile, Indutiomarus, a leader of the Treveri, begins to harass the camp of Labienus daily, until Labienus sends out cavalry for the express purpose of killing Indutiomarus. After killing Indutiomarus, the Roman cavalry routs the rest of Indutiomarus' army. Caesar personally stays in Gaul all winter due to the risk of unrest among the Gallic tribes. Caesar enlists a large number of new troops to replace the ones lost the previous year when the forces of Q. Titurius Sabinus and L. Aurunculeius Cotta were slain by the forces of Ambiorix. Meanwhile, the Treviri, angry over the death of Indutiomarus, fervently try to arouse the Belgian and German peoples around them to fight the Romans. In response to this, Caesar lays waste to the territory of the Nervii, neighbors of the Treviri. Caesar holds a council of Gaul, but the Senones, Carnutes, and Treviri do not send representatives. Caesar quickly marches to the territory of the Senones. Acco, their leader, is forced to ask for pardon and give hostages to Caesar as collateral. This arrangement is acceptable to Caesar because he does not wish to pursue war with the Senones. Instead, he turns his attention to the Treveri and Ambiorix. Caesar lays waste to the territory of the Menapii, and they sue for peace. After warning them not to help Ambiorix, he heads toward the Treveri. The Treveri prepare to attack the camp of Labienus. Labienus, wishing to tempt the Treveri to attack in a situation favorable to the Romans, orders his men to break camp as though they are retreating. The ruse works, and the Treveri are drawn into battle and routed by the Romans. Caesar decides to cross the Rhine again so that Ambiorix might not be able to receive help or quarter there. At this point in his commentary, Caesar gives a thorough description of Germanic culture, customs, and animals. After crossing the Rhine back into Gaul, Caesar sends troops ahead of him to surprise Ambiorix, but Ambiorix escapes. Ambiorix warns all the Eburones to flee to safety. Cativolcus, the aged king of one half of the Eburones curses Ambiorix and commits suicide because he wishes neither to engage in war nor flee from his home. Caesar establishes fortifications in several places within the territory of the Eburones. Engaging the Eburones because the difficult terrain of the area provides them with numerous opportunities to hide from the Romans. Caesar invites neighboring tribes to come and pillage and plunder the Eburones. The Sigambri, and Germanic tribe, come and take a large amount of cattle. Learning that all the Roman supplies and equipment are stored at Atuatuca, the Sigambri head there to try to capture it. Cicero, in charge of Atuatuca, is not supposed to let anybody out of the camp for the sake of security. But on the seventh day, thinking that it would not be dangerous, Cicero allows some troops to exit the camp to forage for food. At that very moment, the Sigambri arrive, throwing the Roman camp into a panic. Hampered by fear and surprise, the Romans suffer losses but eventually mount a defense. The Sigambri retreat, and Caesar arrives, complaining that the troops had not been kept within the camp, as he had ordered. Caesar marches out again, gathering a large number of auxiliaries. They exert much effort to find Ambiorix, but he evades their grasp. After devastating the territory of the Eburones, Caesar holds a council of Gaul in which he investigates the rebellion of the Senones and Carnutes mentioned at the beginning of book six. Acco, the leader of the rebellion, is found guilty and put to death by Caesar. While Caesar is in Italy, he decides to enlist more troops because of political disturbances in Rome. When the Gauls hear of this, they conspire to rebel and prevent Caesar from returning to his troops stationed in Gaul. The Carnutes take the lead in this endeavor, slaughtering and plundering the Roman citizens at Cenabum. Vercingetorix, a young nobleman of the Arverni, gathers troops, and with the support of neighboring tribes is given supreme command of the Gallic armies. At first the Bituriges resist, but then join forces with the Arverni. As more and more Gallic tribes join the rebellion, Caesar reaches his armies in Narbo and begins to move them toward the territory of the Arverni. Caesar surprises the Arverni by arriving in their territory unexpectedly after clearing a path through deep snow. Caesar moves quickly to rendezvous with his legions wintering among the Lingones before Vercingetorix can realize what is happening. Vercingetorix decides to attack Gergovia, a town of the Boii who are allies of Rome. Caesar pillages and burns Cenabum, the town attacked earlier by the Carnutes. Vercingetorix tells his troops that they must adopt a new strategy: burn all the towns and crops in the area so as to starve the Romans. The Gauls burn all the towns of the Bituriges except Avaricum, which they decide to defend. Near Avaricum, Vercingetorix camps near Caesar and inflicts heavy losses on Romans as they forage for food. The Romans ask their Gallic allies for food, but this accomplishes little and the Romans suffer from lack of food. The Romans lay siege to Avaricum. After twenty-five grueling days of constructing siege works under great stress, the Romans attack and trap the Gauls in the town. The Romans slaughter almost all of the Gauls within the town, causing a huge loss for the Gauls. Caesar then sets out for the town of Gergovia. He builds elaborate siege works with the intention of completely encircling and starving the Gauls inside. Caesar is distracted from the siege by betrayal from his Gallic allies the Aedui, led by Litaviccus whom he fought and defeated after a desperate struggle. Caesar then went back to Gergovia and realised that his siege would fail. He creates a false retreat to lure Vercingetorix into battle, but this fails and the Romans are defeated by Vercingetorix. Labienus battles the Parisii, and the entire Gallic war becomes more dangerous as the Aedui, Rome's longtime allies, revolt and try to induce other tribes to revolt as well. After Vercingetorix's cavalry is defeated in a skirmish with the Romans, he moves his forces to the town of Alesia. Caesar builds a circumvallation around the town to lay siege to it but Vercingetorix had summoned his Gallic allies to attack the besieging Romans, so Caesar built another outer fortification, a contravallation, against the expected relief armies (resulting in a doughnut-shaped fortification). Since Vercingetorix was inside Alesia, the Gauls attacking from the outside were without his leadership. However, the attacks did reveal a weak point in the fortifications and the combined forces on the inside and the outside almost made a breakthrough. Only when Caesar personally led the last reserves into battle did he finally manage to prevail, leading to the surrender of Vercingetorix. While in winter quarters in Bibracte, Caesar learns that several tribes are planning a revolt. After quelling a rebellion among the Bituriges, Caesar rewards his troops with large monetary bonuses. The Romans stop the Carnutes from waging war against the Bituriges. The Bellovaci, a Belgic tribe, raise an army and begin to wage war against the Suessiones who are under the patronage of the Remi, allies of Rome. The Bellovaci try to get other tribes to join in their rebellion. Caesar campaigns against them and defeats them. Caesar lays waste to the territory of the Eburones. Labienus wages war against the Treviri. The Romans quell a revolt among the Pictones. Drapes, a Senonian, gathers troops, joins with Luterius, a Cadurcian, and tries to attack the Roman province in the southern part of Gaul called Gallia Narbonensis. Drapes and Luterius stop at a town called Uxellodunum which is strongly fortified by its geography. After a bloody conflict, the Romans defeat them by cutting off the supply of water to the town. Labienus defeats the Treveri and captures their leaders. Caesar goes to Aquitania to assure the loyalty of the tribes there. Caesar puts his legions in winter quarters among various tribes of Gaul. While Caesar is in winter quarters among the Belgae, Commius the Atrebatian begins to harass the Romans by attacking their convoys. The Romans defeat Commius. Since Caesar's term of office in Gaul is almost over, he does not wish to get involved in another war just as he is finishing his term. Therefore he tries to ensure peace by treating all the Gauls respectfully and giving gifts to the leading men of Gaul. Caesar travels to Italy in order to encourage the people to vote for Mark Antony, his close associate, for the office of augur. Some of Caesar's political opponents want to prevent Mark Antony from being elected simply as a way to oppose Caesar. While en route to Italy, Caesar hears that Mark Antony has already been elected as augur, and the townspeople give Caesar a generous and celebratory welcome. Within the senate there is division between the supporters of Caesar and supporters of Pompey. Some worry about Caesar and Pompey having such powerful armies. The Senate passes a decree that Pompey and Caesar should each contribute one legion to the Parthian war in the East. But in reality Caesar actually ends up contributing both of them. The legion that Pompey contributes is his in name only, because it was enlisted in Caesar's territory, and then Caesar contributed another legion that had been with him previously in Gaul. So the levy of troops in reality took away two legions from Caesar. When these two legions were delivered to Italy, instead of being sent to fight against the Parthians, they remained in Italy and were handed over to Pompey. This act made it obvious that Caesar's opponents were planning to wage war against him.